Gilas Pilipinas failed to capitalize on the absence of Iran's two top stars as it absorbed a 70-78 loss in the fifth window of the World Cup qualifiers on Monday, December 3, at the Mall of Asia Arena. 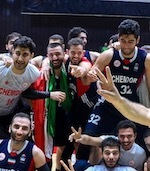 Despite missing Hamed Haddadi and Nikkhah Bahrami, the visitors managed to pull off the come-from-behind triumph to repeat on the Filipinos, who fell to 4th place with a 5-5 record in Group F. Gilas, despite back-to-back homecourt advantage, went winless in the fifth window as it crumbled down in crunchtime due to costly turnovers. The Philippines was primed to rebound from its shocking loss to Kazakhstan on Friday after leading 60-52 early in the 4th quarter off a Beau Belga (198-PF-86) triple. But Iran unloaded a blistering 15-2 spurt powered by Mohammad Jamshidi (199-SF-91)'s 12 points to take a 67-62 lead. It was a nip-and-tuck battle from there with the Filipinos gaining a 71-70 advantage off a June Mar Fajardo (210-C-89) putback with a minute left until the Iranians scored 8 unanswered points for the win. Jamshidi and Behnam Behnam Yakhchali (196-SG-95) conspired for back-to-back buckets to give Iran a 73-70 lead. Iran then forced back-to-back turnovers from Scottie Thompson and Troy Rosario to end its two-game skid. The Iranians improved to 7-3 to keep their hold of 2nd place in Group F. Jamshidi delivered 20 big points in the 4th quarter and finished with 26 total on top of 7 assists and 4 rebounds while Behnam Yakhchali pumped in 21 points, 7 rebounds, 4 assists and 3 steals. Jayson Castro William (180-PG-86), who served a three-game suspension from FIBA, paced Gilas with 19 points and 5 rebounds while Christian Standhardinger (206-F-89, college: Hawaii), who replaced Stanley Pringle (184-PG-87, college: Penn St., agency: Pensack Sports) as Gilas' naturalized player, churned out 17 points and 8 boards. Gilas needs to sweep its final two games in the sixth and final window - both away contests - to remain in the hunt for a World Cup berth.